It is to inform that Govt. of Telangana Vide G.O.Ms. No. 40, dt: 06.07.2017 of the TW(Budget & Edn) Department have accorded administrative sanction for establishment of (22) Residential Degree Colleges for providing quality education to rural talented tribal students. Out of (22) Residential Degree Colleges (15) colleges are sanctioned for Women and (7) for Men. The said colleges have the following groups viz. M.P.C, M.P.Cs, B.Z.C, M.Z.C, Biotech.Z.C, B.Com(General), B.Com(Computers), B.A.(H.E.P.) and B.A. (E.P.Pub.Admn). Appointment of Guest lecturer/ part time Lecturer is based as per the requirement in the colleges. 1.Candidates having Masters Degree (i.e., M.A/ M.Sc/ M.Com./ M.C.A./M.Sc. (Comp. ))/ M.Tech (Comp.Sci.) With a minimum of 55%, in case of SC/ST, 50% of marks in the relevant Subject are eligible to apply. 50% weightage would be given for marks secured in P.G. Candidates with NET/SET and Ph.D. shall obtain 30 marks for the additional qualifications. *As per the criteria mentioned above, top meritorious candidates will be called for Interview @1:4. 1. The selected Guest Faculty/ Part time Lecturer shall have to perform all the Residential pattern duties assigned to them by the Principal/ Head Office. 2. 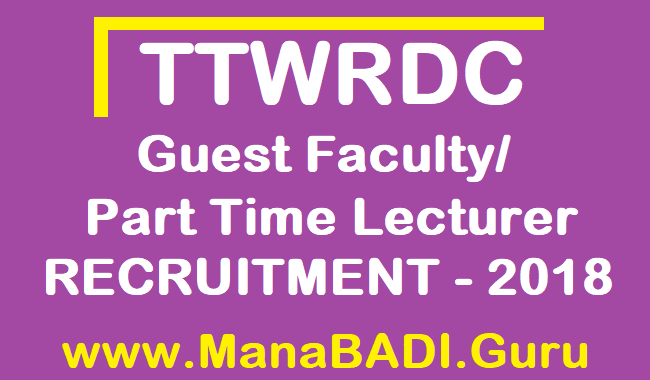 Women Guest Faculty/ Part time Lecturer may be posted to Women’s and Men’s Colleges. 3. Men Guest Faculty / Part time Lecturer shall be posted to Men’s Colleges only. 4. Merely applying for the post shall not entitle the candidates for any claim to the Guest faculty/ Part time Lecturer position without following the selection procedure. All Eligible and Interested Candidates have to apply online through official website www.tgtwgurukulam.telangana.gov.in. from 6th April 2018 to 18th April 2018. 3. Date of Demo/interview - 25.04.2018 Onwards. (Candidates shall be intimated through SMS).